This advanced Viton™ polymer has been compounded in a liquid form to provide excellent chemical resistance and ease in use. This product made with Viton™ resists virtually all mineral acids and hydrocarbons, including Nitric, Hydrochloric, and Sulfuric. The product can operate in extremely hot environments up to 450° F. All three products are compounded based on the same Viton polymer only available from Chemours and Thermodyn™. All Hazmat shipments to be shipped from Thermodyn’s Ohio facility. Fluorodyn™ one part caulk (made with Viton™) was developed in conjunction with DuPont engineers to perform in high temperatures, aggressive vapors, and extreme environments. It is easy to apply and comes in convenient caulk tubes that can easily fit in standard caulk gun applicators. These tubes are also re-sealable and available in small quantities down to 2.5 oz. tubes. 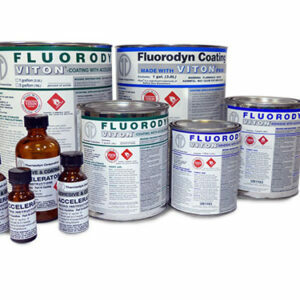 Fluorodyn caulk resists virtually all acids and hydrocarbons, including Nitric, Sulfuric and Hydrochloric Acids. It performs well in corrosive environments that require flexibility, leak-proof sealing, and high resistance to permeation. Performance you can depend on, names you trust. Thermodyn™ and Fluorodyn™ (made with Viton™).